One day, my computer was working perfectly, next day I start computer, and I was not able to get to the Windows. Can someone help me to solve this problem because I don't have any idea what's going on? Monitor(s) Displays LG Flatron Wide 22"
I cannot get into Windows because Of BSOD than how I can use "SF Diagnostic Tool" and "SF Debug Tool"? Can you boot into Safe Mode ? The driver that is failing is the Storage Controller. So if you cannot boot at all, in any mode, there is a mere possibility to salvage the windows installation. So if you can boot into safe mode, execute the SF Diag tool there and upload it. Even if you cannot access safe mode too, let us know that. First of all, you should install Service pack 1 and all other windows updates. Otherwise the system will remain vulnerable to threats. 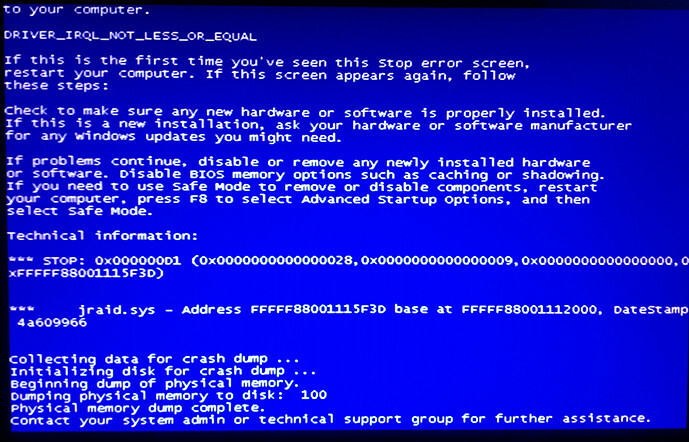 The BSOD is caused by JMicron JMB368 Controller. And it is too old. Depending on the age of the computer, it is difficult to say that it is the only issue there. Sol et us know how the computer is running after the driver update. Nothing changed for better !!! Nothing is received form this post. You need to be elaborate and specific. What do I have to specify. My situation is the like before. I'm getting BSOD with the same info. I updated everything what I was told, and nothing changed. No JMmicron JMB36X SCSI adapter found! Setup program will terminate! Now that is odd, because that is the one which crashed and caused the BSOD. Get prepared for a clean install. Boot into the BIOS, and set the storage controller mode to AHCI. If there is any JMicron option, disable it. Then perform a Clean Reinstall - Factory OEM Windows 7 .... which will install windows with keeping JMicron aside (and it is not anything needed at all).